I see seashells by the sea… or doesn’t the rhyme go something like that? I forget.. but what I DO know, is that my kids LOVE collecting shells – all the time. 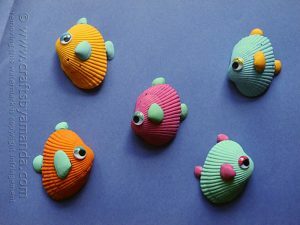 They are irresistible, so I thought it would be nice for us to have a Shell Craft Ideas hangout for you and create this sea shell craft video! 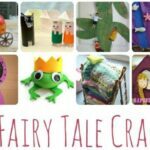 We love nature crafts for kids and we especially love shell craft ideas!! 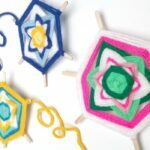 And of course have a great set of Summer Crafts for Preschoolers too! First thing to note: before you go shell collecting, please check with your local beach whether it is allowed, as some beeches prohibit it. Second thing: always wash your shells thoroughly once home and let them dry completely before using them! 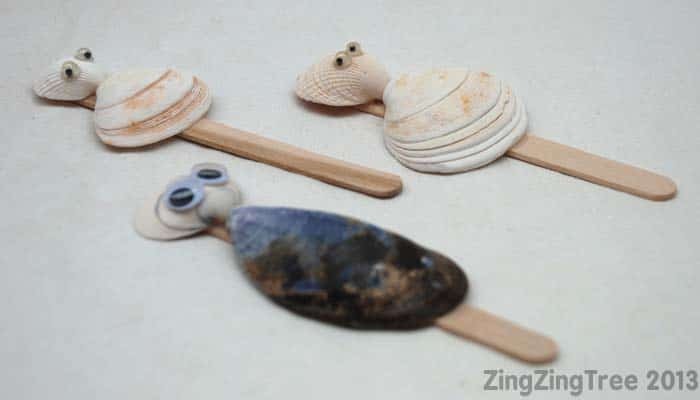 Note: these Sea Shell Crafts were first published in July 2013 and have been updated and republished for your convenience. 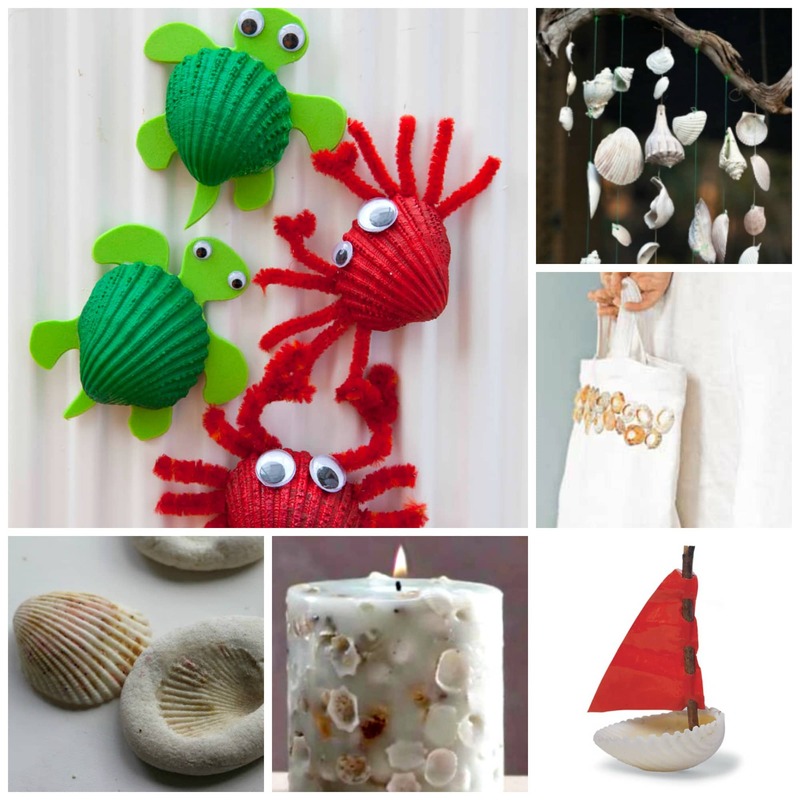 How we love a Shell DIYs for summer!! 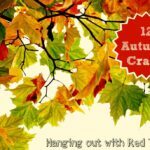 Many moons ago we used to do “crafty hangouts” – where 6-8 of us craft bloggers got together and shared our crafty ideas around a given topic. Here we have our “Shell Craft Ideas” video with links to more information below! 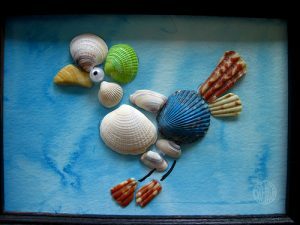 There are lots of Seashell Crafts for Kids shared in this video! 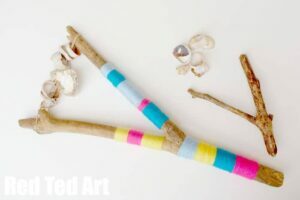 Drift Wood and Shell Rattles – if you bring some string/ elastics with you to the beach, you can make them WHILST at the beach.. love. 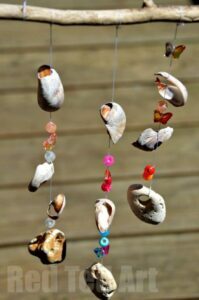 Bead and Sea Shell Mobile – an easy make for young kids. We have two sets hanging in our garden now and whenever i see them I think of our different days to the beach! One with Grandpa and one on a VERY WINDY day!! 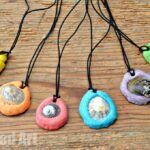 Easy Shell Necklaces – these are SO easy to make and great for little hands. 1) The obvious things to do with shells of course is PLAY! I share my little girl’s adorable little “doll” bed right at the beginning of the video. However, they love playing with shells all the time. They line them up. They put them in a box. They take them out again. They share them out. They use them as “pretend money” in the “pretend shop”. They count. Etc etc. A friend once painted them all golden and then did a “treasure hunt” at a pirate themed party. Adorable. So. Shells definitely are great for PLAY! 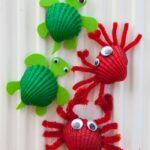 2) On the video I show you our Turtle and Crab Shell Fridge Magnets and describe how we make them there. They are also in my book Red Ted Art (available in the UK and with free international postage). 3) Kids Chaos describes the delightful art session with Grandma and Grandpa. Love that the kids got arty and crafty across the generations. And the time together meant as much (I think) as the artwork itself. Lovely family memory building (full post to follow). 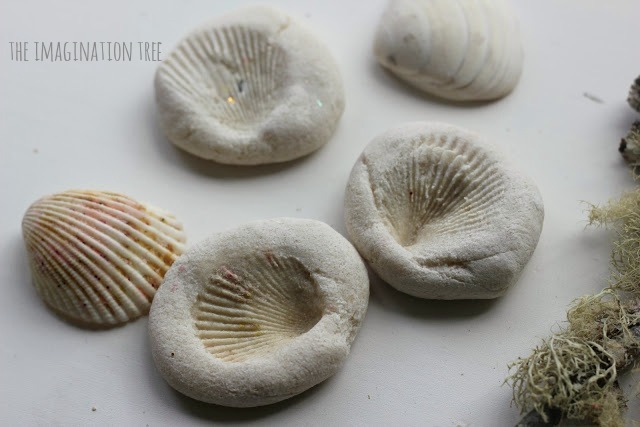 4) The Imagination Tree makes lovely Saltdough Shell imprints, fun and fascinating for the kids to make and look super pretty. Lots of learning and developmental opportunities too. 5) Zing Zing Tree has a RANGE of ideas for us again! First up she shows us adorable little shell teacups! Super cute and definitely on our to do list. (full post to follow). 7)… Zing Zing Tree also a delicate barnacle bracelet (watch the video around 5min 40 sec in) and..
9) and finally (yes, that Zing Zing Tree has lots of lovely ideas), she shares a little shell “hanging” decoration – great for threading activities and keeping small hands busy! 10) Crystal shares a great necklace ideas – making the most of the shell’s “broken” centre. It looks perfect as single “ornament”. 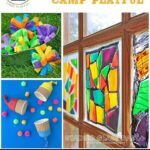 11) Domestic Goddesque, got creative, first PRINTING with (oyster) shells… fabulous fun artwork, messy play AND you can turn it into wrapping paper..
12)… and with the coloured shells, she then created a lovely picture frame. Love it. 13) Me and My Shadow’s shell decorated elephant – which formed part of their “elephant parade” artwork. Love them ALL. 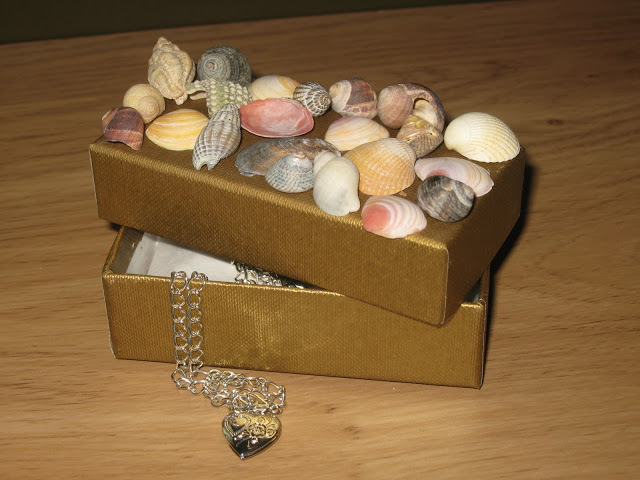 14) And she also shares, a “shell must” craft – the shell treasure box. 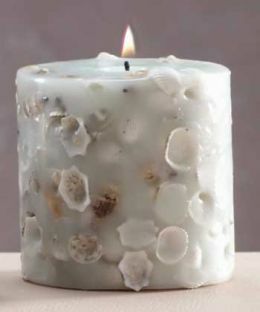 15) I LOVE these simple shell candles from Hub Pages – there are more ideas on this page too, but I thought the candles where quite original! 17) We have some more planters from Martha Stewart comes up with some pretty looking flower pots. 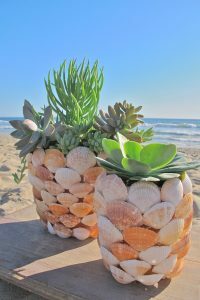 As well as – Or if you have LARGE shells to hand, consider making some Shell Planters. They look wonderful. 18) A different take on the shell candle idea, are these simple flat shell candles (paint them first or keep them plain), OR these clam shell candles (you do need to take a peak at these!). Beautiful. 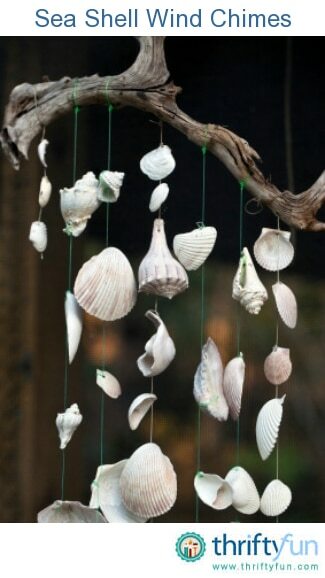 19) We love some shell windchimes or mobiles. 20) Love the shell place settings (these are to buy, but am sure we can work out how to make them?)! 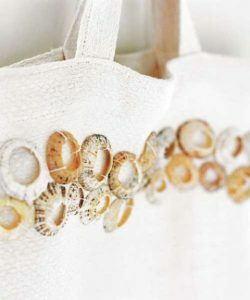 21) And things this shell tote bag is beautiful too – perfect for those “holey” shells! 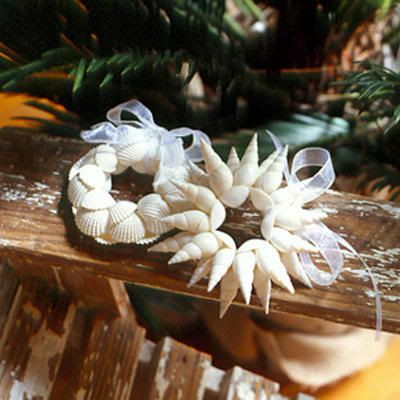 22) And these shell ornaments would be great for a seaside Christmas! 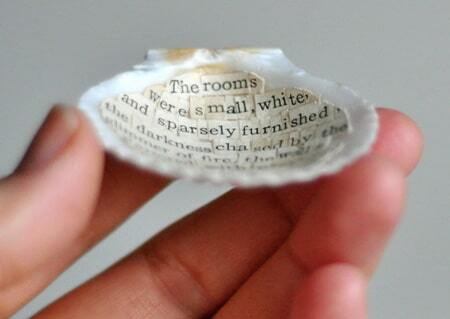 24) Last but not least – Seashell poetry – what a wonderful way to capture holiday moments! 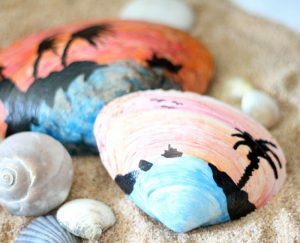 25) Wonderful Painted Seashells. How pretty are these?! 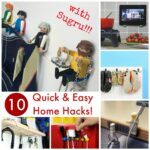 Find out more over on Moms and Crafters! 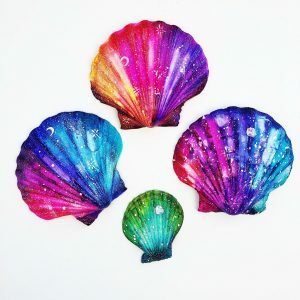 26) How to paint GALAXY shells by Color Made Happy! 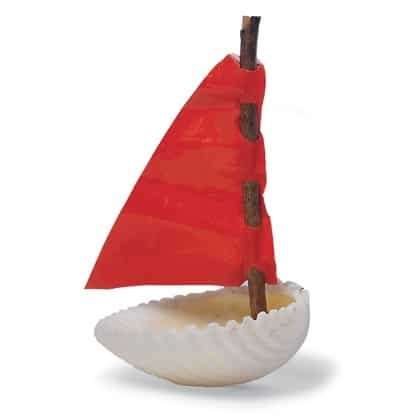 Similarly to our Walnut Boats, why not make a little Shell Boat? 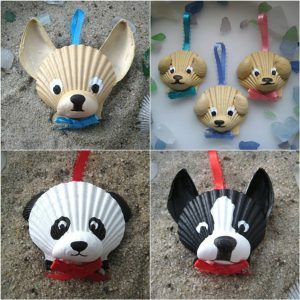 I also ADORE these Shell Dog Ornaments from Etsy! 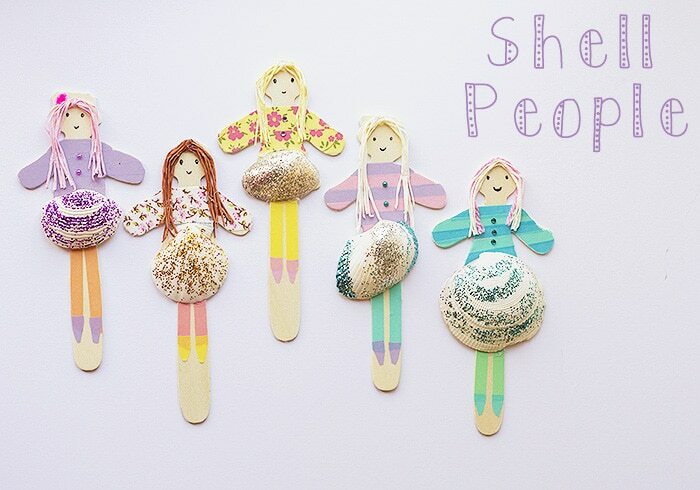 We love these Seashell Dollies. Adore how colourful these Seashell Ornaments are… combine your summer finds with colourful buttons to create these! 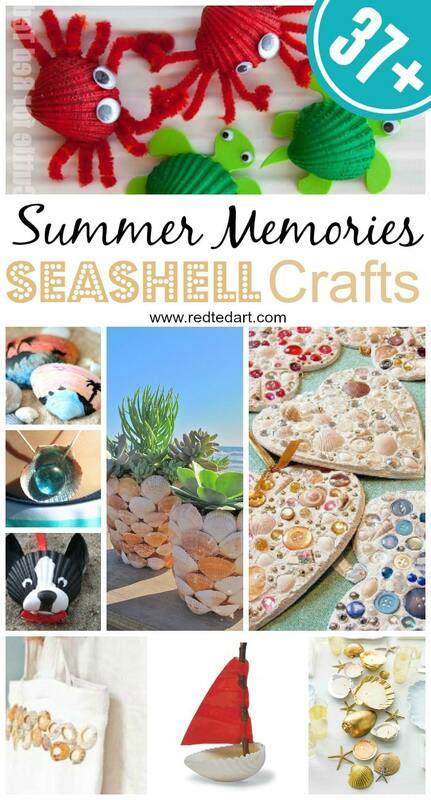 Collect a BIG STASH of seashells.. then use your wonderful summer finds to create fabulous keepsake Seashell Art! 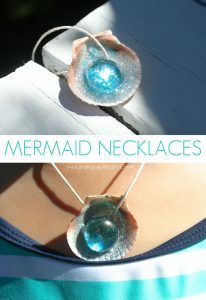 Another great and easy seashell craft ideas for kids, are these gorgeous Shell Mermaid Necklaces from Mama Papa and Bubba! Hope you enjoyed this collection of seashell crafts and shell DIYs and that these will help you cherish your holiday moments! Lovely list of ideas, we have a jug of shells from lasr summer’s holiday that have been forgotten about, time to dig them out I think! I looked at all the shell ideas and found some great ones. 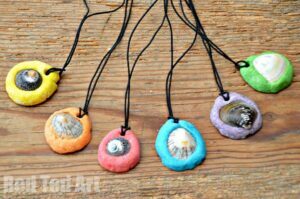 I frequently search for shell art, because I also do art with seashells although a bit different than the ideas I found on your website. I you wish you and your friends can have a look at my blog and maybe comment as well.